Summer is upon us, and that means temperatures are rising! It’s easy for most of us to stay cool and safe during the day, but what about our dogs? It’s important to take precautions for your pet during the Dog Days of Summer. Tasman’s Natural Pet wants to make sure you know what to do in order to keep your dogs healthy and happy, so lets take some time to address the signs your dogs gives when he or she is over heating! When dogs are overheated, heat stroke is the most dangerous situation. It is most common on humid days, that occur in the early parts of summer, when your dogs hasn’t had time to adjust to the summer heat. Older dogs, as well as short nosed breeds are predisposed to developing heatstroke. When your dogs’ body temperature rises, many internal organs may be effected, and it can be fatal. The earliest sign of heatstroke is excessive panting with excessive salivation. As your dog gets hotter, their gums will begin to dry, and turn in color to a dark pink. In some cases, your dog may have trouble standing. In severe cases, dogs with heatstroke may experience seizures. The best treatment is to be proactive, and make sure your dog has plenty of fresh water. It is best to avoid exercise during the hottest parts of the day, and if your dog can’t come in doors, provide a shady spot for them to rest. 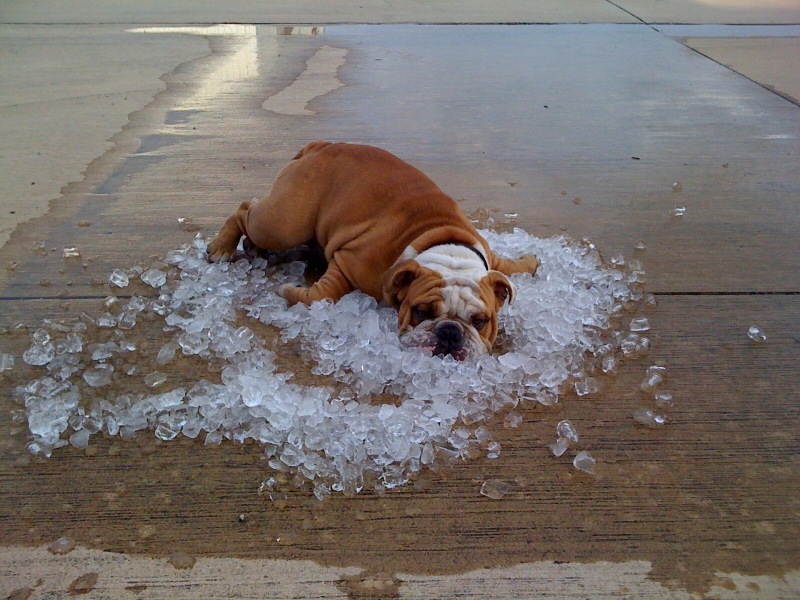 If you’re concerned that your dog is over heated, you should cool them down with cool water, and not ice cold water. If your dog becomes weak or collapses rapid cooling is the most important thing to do before getting them to a veterinarian. Over heating is a scary situation for your dog, but it is very easy to avoid. As long as we all keep a close eye on our dogs we can keep them safe, happy, and healthy. If you’d like to give your dog a fun treat that you’ll get a kick out of as well, take a hint from our friend above, and give them a nice ice bed to cool off on! ← Tasman’s New Jerky Treats!